You are here: Home / Crafts / Create this Winter Evening Nail Art Design with only 3 colors! Create this Winter Evening Nail Art Design with only 3 colors! 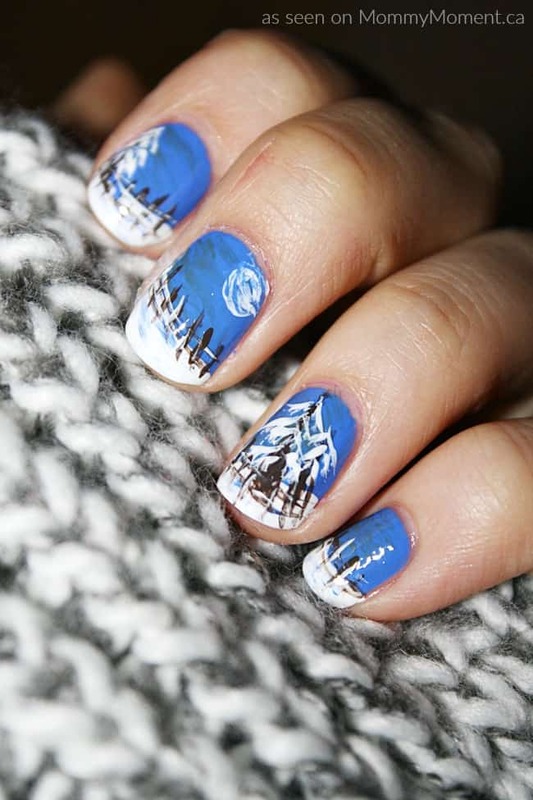 Snow covered trees are just so pretty that I thought I’d show you a great Winter Evening Nail Art Design. We have finally got a good layer of snow on the ground where I live, and I’d say it about time! The trees are so gorgeous when they are covered in a fresh layer of snow and it reminded me of this design I did a year ago but never got around to sharing with you. If you haven’t noticed, winter is my favourite season. Definitely! So if you want to try to do these on yourself or a friend they are fairly simple and I’d say give it a shot! The trees don’t need to look perfect. You’re the creator so each one can look however you want it to. The goal is to have fun! To see more beautiful nail art created by Meg, check out our Nail Art and Design Board on Pinterest or follow Meg on Instagram at megsnails1360. This post was submitted by Megan for Mommy Moment. Really beautiful 🙂 That is some talent! 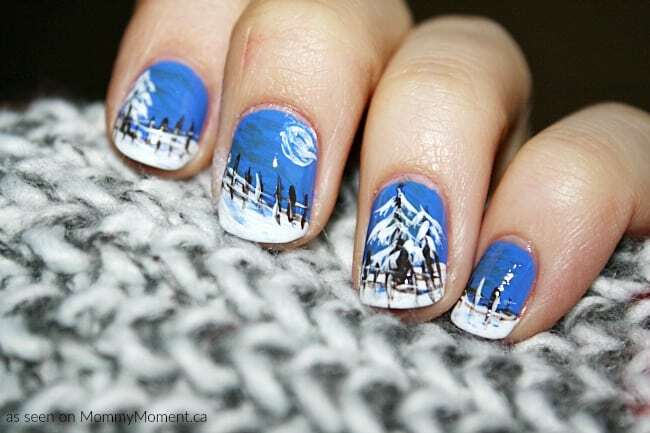 Such a beautiful winter scene on the nails, very talented!! Thats an awesme job,i am never steady enough to make a design! Absolutely love this!! I love the artsy look so much! Such a great way to display art! These are really pretty. I like the blue colour. Oh my gosh. There is no way I could do that. That is so cool.